The VSI, like the altimeter, gives an indirect indication of pitch attitude and is both a trend and a rate instrument. As a trend instrument, it shows immediately the initial vertical movement of the airplane, which disregarding turbulence can be considered a reflection of pitch change. To maintain level flight, use the VSI in conjunction with the altimeter and attitude indicator. Note any positive or negative trend of the needle from zero and apply a very light corrective elevator pressure. As the needle returns to zero, relax the corrective pressure. If control pressures have been smooth and light, the needle reacts immediately and slowly, and the altimeter shows little or no change of altitude. As a rate instrument, the VSI requires consideration of lag characteristics. Lag refers to the delay involved before the needle attains a stable indication following a pitch change. Lag is directly proportional to the speed and magnitude of a pitch change. If a slow, smooth pitch change is initiated, the needle moves with minimum lag to a point of deflection corresponding to the extent of the pitch change, and then stabilizes as the aerodynamic forces are balanced in the climb or descent. A large and abrupt pitch change produces erratic needle movement, a reverse indication, and introduces greater time delay (lag) before the needle stabilizes. Pilots are cautioned not to chase the needle when flight through turbulent conditions produces erratic needle movements. The apparent lag in airspeed indications with pitch changes varies greatly among different airplanes and is due to the time required for the airplane to accelerate or decelerate when the pitch attitude is changed. There is no appreciable lag due to the construction or operation of the instrument. Small pitch changes, smoothly executed, result in an immediate change of airspeed. When using the VSI as a rate instrument and combining it with the altimeter and attitude indicator to maintain level flight, a pilot should know that the amount the altimeter needle moves from the desired altitude governs the rate that should be used to return to that altitude. A rule of thumb is to make an attitude change that results in a vertical-speed rate approximately double the error in altitude. For example, if altitude is off by 100 feet, the rate of return to the desired altitude should be approximately 200 feet per minute (fpm). 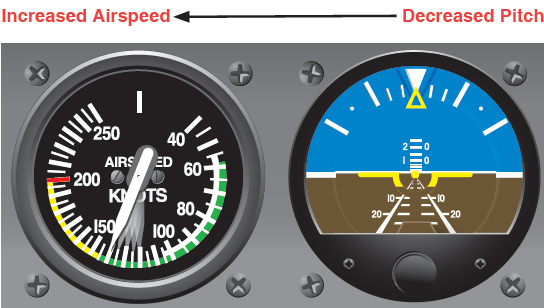 If it is off by more than 100 feet, the correction should be correspondingly greater, but should never exceed the optimum rate of climb or descent for the airplane at a given airspeed and configuration. A deviation of more than 200 fpm from the desired rate of return is considered overcontrolling. For example, if attempting to change altitude by 200 feet, a rate in excess of 400 fpm indicates overcontrolling. When returning to an altitude, the VSI is the primary pitch instrument. Occasionally, the VSI is slightly out of calibration and may indicate a climb or descent when the airplane is in level flight. If the instrument cannot be adjusted, take the error into consideration when using it for pitch control. 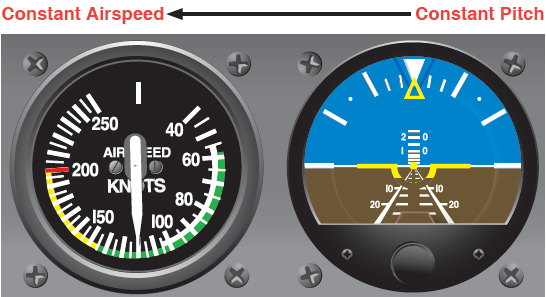 For example, if the needle indicates a descent of 200 fpm while in level flight, use this indication as the zero position. The ASI presents an indirect indication of the pitch attitude. In non-turbulent conditions with a constant power setting and pitch attitude, airspeed remains constant. [Figure 7-13] As the pitch attitude lowers, airspeed increases, and the nose should be raised. [Figure 7-14] As the pitch attitude rises, airspeed decreases, and the nose should be lowered. 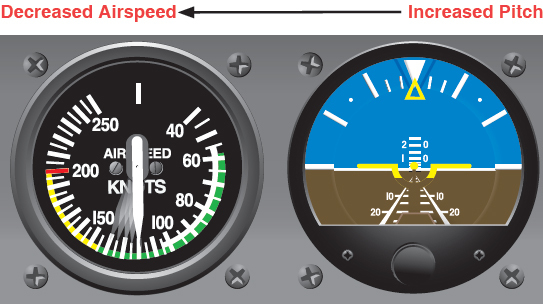 [Figure 7-15] A rapid change in airspeed indicates a large pitch change, and a slow change of airspeed indicates a small pitch change. Figure 7-13. Constant power plus constant pitch equals constant speed. Figure 7-14. Constant power plus decreased pitch equals increased airspeed. Figure 7-15. Constant power plus increased pitch equals decreased airspeed. Pitch control in level flight is a question of cross-check and interpretation of the instrument panel for the instrument information that enables a pilot to visualize and control pitch attitude. Regardless of individual differences in cross-check technique, all pilots should use the instruments that give the best information for controlling the airplane in any given maneuver. Pilots should also check the other instruments to aid in maintaining the primary instruments at the desired indication. As noted previously, the primary instrument is the one that gives the most pertinent information for a particular maneuver. It is usually the one that should be held at a constant indication. Which instrument is primary for pitch control in level flight, for example? This question should be considered in the context of specific airplane, weather conditions, pilot experience, operational conditions, and other factors. Attitude changes must be detected and interpreted instantly for immediate control action in highperformance airplanes. On the other hand, a reasonably proficient instrument pilot in a slower airplane may rely more on the altimeter for primary pitch information, especially if it is determined that too much reliance on the attitude indicator fails to provide the necessary precise attitude information. Whether the pilot decides to regard the altimeter or the attitude indicator as primary depends on which approach will best help control the attitude. In this handbook, the altimeter is normally considered as the primary pitch instrument during level flight.